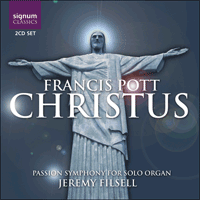 Signum Classics are proud to release Jeremy Filsell's debut disc on Signum Records -Christus: Passion Symphony by Francis Pott. This extraordinary work is a virtuosic masterpiece, and one that many-an-organist might be fearful of performing, let alone recording, ‘live’. Jeremy Filsell’s masterly musicianship and skills here produce a stunning live account of this important work. Christus (1986-1990) owes little to the French tradition of the organ symphony. Its concern with motivic unity and evolving tonality arises principally from a deep interest in the (orchestral) symphonic methods of the Danish composer Carl Nielsen, while certain harmonic habits relate more specifically to his Fourth and Fifth Symphonies. It would be rash to suggest such a kinship were Christus not a determined exercise in cyclical integration. The five movements of Christus trace respectively the Coming of Christ; Gethsemane; the Via Crucis / Golgotha / the Deposition; the Tomb; and, finally, Resurrection, portrayed not as a prolonged psalm of victory already attained but as a vast struggle towards ultimate triumph. Any narrative dimension applies principally to the central three movements, which together approximate to the length of either the first or the last. The music may be described as fundamentally tonal, though listeners may sympathise with a treasured dry comment by the composer Patrick Gowers, who observed that he did not think he would care to be asked to sing doh. Tonal character resides more in long-term destinations, and in individual notes as gravitational points, than in conventional diatonic relationships. Triadic shapes are offen in conflict with their harmonic bass, and embrace elements of bi- or atonality as a consequence of chromatic voice-leading. The first four notes of the work (D-E-C sharp-F) articulate a progression which both dictates an overarching tonal cycle and becomes a continual motivic presence. The first movement responds to this motif by ultimately reaching the tonal centre F (the motifs fourth note). The second movement, opening with the motif transposed to start on F, duly ends on A flat. Repeated application of this principle brings about a fresh start from D at the outset of the finale. However, this movement eventually breaks the cycle by distorting the motif to D-E-C natural-F sharp. C natural is then enharmonically absorbed as a sharpened fourth of the transposed Lydian mode and the work ends in F sharp major. The first movement, Logos evolves into a listless fugato after a strict exposition, evoking a world as yet devoid of any affirmative or elevating impulse. After a brief climax a succession of ideas is heard. The mood becomes restlessly expectant and the tempo accelerates. After the first substantial climax in the Symphony (still based on the four-note motif) an extended Allegro is launched. Its rhythms inhabit a conscious middle ground between mediaeval and modern practices, while the intermittent presence of a pedal C sharp undermines an ostensible D tonality. Eventually a further climax occurs, temporarily consolidating C sharp. After a more spacious passage the dynamic level drops. A chorale theme is heard for the first time, ornamented by fragmentary patterns beneath. This is destined for increasing significance throughout the work as a whole, assuming many harmonic guises and ultimately crowning the Resurrection finale. Insofar as there exists any specific 'Christ motif', the chorale may be felt to provide it. There follows an extended free development of material heard hitherto. In due course the Allegro is recapitulated, but rising tension is dissipated by a remote chordal statement of the chorale (which shows a tendency to remain open-ended until its apotheosis near the close of the work). The resumed Allegro presents a steady escalation through successive restatements of the 'motto' four-note theme, beginning in the depths with an unceremonious interruption and rising inexorably towards the final bars. Fitfully dramatic and beset by sudden contrasts, the movement seeks to convey some impression of the Holy Spirit [Logos] contending with a resistant pagan force. Its peroration retains some austerity, as if not yet free from the shadow of the opening fugato. Gethsemane begins monodically with the motto theme, soon introducing a very slow procession of chords. These are in effect a non-vocal 'setting' of the word 'slowly' in the quoted text by Thomas Merton, whose vision depicts Christ as a spectral visitant embodying all the despair of human suffering. Eventually motivic counterpoint asserts itself in a transient chorale prelude (the chorale being sounded by the pedals). The chordal material returns, now silent on the first beat of each bar to allow a pedal development of the four-note motif to show through. An anguished climax intervenes suddenly, subsiding at length until the chordal texture is regained. The music becomes both more meekly accepting and more other-worldly thereafter, though perhaps not before Merton's vision has exposed the ineluctable humanity of Christ's frailty and defeat: that hairsbreadth of salvation which Christian perception of the resurrection as 'fait accompli' threatens largely to obscure. Via Crucis is an exercise in contraction. Its Passacaglia 'ground' sounds five times beginning on A flat, then four on A natural, three on B flat, two on B natural and one on C—the furthest point in the chromatic scale from ultimate 'resurrected' F sharp. Meanwhile, the ground itself begins to distort rhythmically, to admit rests and to unfold in fewer bars, as if unsteady beneath hostile buffeting. The flow of ancillary counterpoint progressively features a descending chromatic motif from the previous movement, as well as the chorale outline and ironic mimicry of the 'ground' notes, whose final reiteration (by now reduced almost beyond coherence) ignites a jagged scherzo. At its height three abruptly recessed quiet passages occur, each followed by related and dissonant outbursts embodying the crudely obvious symbolism of hammered nails. The intention is to suggest the gulf already separating hideous extremities of outward, physical torment from the silence of the soul's struggle within. The third outburst escalates further. Momentary silence intervenes before the central climax of the Symphony, headed 'CRUCIFIXUS' in the published score and bearing words from Revelation: 'Every eye shall see Him, and they also which pierced Him'. This insistent climax finally collapses into an unsettled darkness, from which upward harmonic progressions offer an unashamedly literal suggestion of suffering ended and a winging of the spirit out of this world into another (influenced by Paul Nash's watercolour, The Soul Visiting the Mansions of the Dead). The chorale returns, harmonised with extreme simplicity in quasi-Renaissance fashion. The poetic lines quoted in connection with the third movement relate to this passage especially and were set by Samuel Barber amongst his Hermit Songs. Viaticum evokes a world locked in sleep or buried in some deep midwinter of the spirit. Its rhythmic tread bears some resemblance to the tenor solo in the Agnus Dei of Britten's War Requiem. The music remains confined to modest dynamic levels and pursues its hibernatoty course to the prescribed tonal point, D. Far-distant references to the chorale conjure a faint memory of the living world reaching into an entombed stillness. The music embodies two momentary homages to the much mourned Robert Simpson, one of the great symphonists of this or any age. Resurrectio attempts formal balance with Logos while articulating a great struggle toward the light. It begins with a thunderous declamation of the motto theme and a stormy, cadenza-like introduction which comes to rest on a chord of F sharp (anticipating but not forestalling the work's peroration). The movement 'proper' then embarks from the tonal point E and gives prominence to a new, irregular motif. Logos is recalled rhythmically, without specific recapitulation as yet. The chorale reappears (sereno), leading to free development of itself and the motto theme. A chromatic outline, first heard in Gethsemane, appears in inversion, climbing with each recurrence. A moto perpetuo of detached chordal quavers initiates an immense cumulative process, embracing progressive jaggedness of rhythm and the steady return of earlier toccata figuration. The chorale is declaimed first by the manuals over rapid chordal patterns and then, in augmentation and in octaves, by the pedals. Fleeting references to the tonal cycle of all five movements are heard. The eventual climax is as massive as that of Golgotha. The descent from this climax induces a semblance of calm. References to the opening of Logos lead to a passage where the sustained chords of Gethsemane become fused to phrases from the work's opening and from the chorale, embellished by triplet quaver figuration. The music becomes hesitant—the first sign of yet greater struggles ahead. From uncertain beginnings a semiquaver line emerges. This proves to be the exposition of a fugue, but, whereas Golgotha was a study in contraction, this fugue is an essay in elusive tonality. Its entries are pitched not at tonic and dominant, but at the distance of an augmented fourth ('tritone'). The device therefore relates to the work's tonal structure, since the diminished chord comprising each movement's starting pitch may be seen to consist also of interlocking tritones. Such a modal form was shunned in early music, since it supplanted the conventional 'perfect' interval between first and fifth note, thus running counter to the established harmonic and tonal order of things—and hence also to the sophisticated mediaeval mind's apprehension of known creation and divine providence as a pattern mystically and mathematically echoed in music. The mode is sometimes termed 'Locrian', and the fugue is headed Fuga Locriana. Eventually it moves unobtrusively, but perhaps unsettlingly, from the time signature of 4/4 to that of 7/8, without interrupting its semiquaver flow. A fugal stretto for three 'voices' is succeeded by the rare and eccentric device known as cancrizans. This, beloved of Baroque contrapuntists, earns its historical name through a bizarre and approximate likening to sideways ('crabwise') motion, whereas actually a melodic strand (in this case, ten bars long) is heard simultaneously forwards and backwards without concession either to pitch or to rhythm. Scholes observes in the Oxford Companion to Music that a cancrizans is a futile academic conceit, the listener being unequipped to perceive it happening. This in itself was whimsically apt, since the fugue itself is heard to lose its way shortly thereafter and to expire on a perplexed, unresolved chord, much as if will and rational thought had shied back in the face of some onslaught yet to come. To those familiar with Nielsen's Fifth Symphony the parallel will be obvious, though the context is changed. An ironic outburst now launches a grotesque parody of the music following the introduction to Resurrectio. Of what follows, 'War in Heaven' (Revelation) best summarises the intention. A 'Showdown' between the affirmative and the demonically destructive is implied through the simple expedients of upward or downward motivic direction and greater or lesser dissonance. The rhythm from the opening of the main part of the movement reaches a furious outburst marked gridando (screeching) before the chorale blossoms suddenly forth in C major. Its key indicates the distortion by which the work's tonal spiral will be broken, anticipating this by embracing both C and F sharp in its opening phrase. Reference to the central climax of the work (in Golgotha) shows that the tonal areas C and F sharp were in collision even there, at the work's opposite pole, though with no resolution yet in sight. The final change of the four-note motto theme (marked very obviously by juxtaposition of both its forms) propels the music into F sharp, now affirmed at length through rhapsodic treatment of the chorale. The precedent of all four eariier movements is followed, in that a cadential formula based upon a fragment of the chorale heralds the music's end. A final reference to the chorale intervenes before sudden silence, and then a greatly prolonged final chord of F sharp—its duratlon well earned by the performer. The easy claim of any definitive spiritual significance in this music must be an impertinence to listener and performer alike. However, a candid—and vulnerable—statement of intention may not go amiss. In an age of scientific rationalism and of casual brutality, Christus attempts to respond in personal terms to the increasing difficulty of any mystical intimations of faith. At the same time, it makes its own search for Christian conviction, in the shadow of a dark century, by embracing anew the notion of a suffering God both within and without creation, and hence of the Crucifixion as an ineluctable truth perpetually re-enacted within all the inhumanities of successive ages. In the event this has become ever more pertinent to Resurrectio, written in the summer of 1990 even as Kuwait became reluctant crucible of the world's newest human calamity. By pure accident, the 'failure' of the central climax in Resurrectio to lay its demons to rest now appears prophetie of the re-opened eye of that same storm over a decade later, as western tanks rolled back into Iraq. It is because of such atrocities, not despite them, that the attempt to articulate a triumph of light over darkness, compassion over brutality or hope over despair seems to find its own rightness, and to discover at its heart the image of the Crucifixion. If these aims are rooted in the proper modesty of confronting one's own human smallness, paradoxically their adequate articulation cannot be so; and there will always be those for whom a work on this scale seems founded only upon fatal egocentricity. In any case, the births of my children and death of my mother since the completion of Christus, heightening that sense that we go whence we came and that the newborn are our clearest messengers of what the poet Yeats called 'the uncontrollable mystery', have served to humble the pages of this music in a way which critics (fiercely divided!) could not have equalled, though one or two have tried. A work such as Christus seems to choose its composer, rather than vice versa, and is almost certainly a once-in-a-lifetime phenomenon. Fifteen years on, a remark borrowed from Ralph Vaughan Williams (on his own Fourth Symphony) best rises to the challenge of an honest self-assessment: 'I don't know whether I like it—but it's what I meant at the time'.